Homemade Peanut Butter Ice Cream with Peanut Butter Cups was the first organic ice cream that I have ever made. Thanks to Unreal Candy I can now make an ice cream that is just as good as what gets served up at Cold Stone Slab, but doesn’t come with any artificial flavors or colors. Unlike other ice creams this has no raw egg inside, so anyone can enjoy this frozen treat. I am using a couple of different types of dairy products in here. I am using heavy cream. Heavy cream is also known as whipping cream and it can be known as industrial cream. Half and half also goes in this recipe. Half and Half is made from equal parts of heavy cream and whole milk. You can find this very often in most grocery stores. I am also using peanut butter, peanut butter cups, sugar, and some vanilla extract. This recipe makes 1 quart. I am using a Whynter ice cream freezer. You will have ice cream in a little less than an hour. I have made many quarts of ice cream with this machine, it makes ice cream that is much like any premium ice cream you would enjoy. It’s definitely not required to use that exact model, but it works very well. Cold Stone Slab Cake Batter Ice Cream. 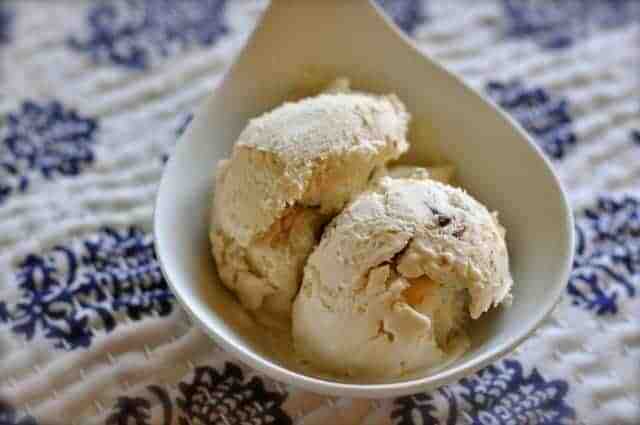 You have got to try this easy to make homemade peanut butter ice cream. In a large bowl combine heavy cream, half and half, sugar, vanilla extract. Stir until well blended. Pour ice cream base into ice cream maker. Follow instruction manual on your ice cream maker, when ice cream is half done, add peanut butter into machine by adding a spoonful at a time. When the ice cream is almost complete, add coarsely chopped peanut butter cups. This is a great ice cream recipe! I made it in my Kitchenaid ice cream freezer and worked like a charm. Thanks!